Significant in its craftsmanship, fine accoutrements and durability, the tea storage box by Apace Living is a coveted gift, one that lends a smile of delight with every use. From the moment you open this generational antique, you'll realize that no expensive was spared, and no detail left unattended. Every intricate detail on this handmade tea storage chest is purposeful, perfected and polished, adding an air of elegance to even the plainest kitchens. You'll appreciate the elegance and effort of this handcrafted antique at every glance. Polished, rounded edges lend to the history of the tea tradition and allow an air-tight environment, keeping tea fresher, for longer. Smoothly opening grooves ensure a graceful tea time experience. Crisp velvet lining cradles your favorite teas until you're ready to choose. Thoughtfully appointed acrylic top looks just like glass, with far greater scratch-resistance. Interior gold hinges were intentionally placed to ensure it opens and closes with ease. 6 Adjustable compartments with removable dividing boards guarantee you can store your favorite tea bags, regardless of size. Tea lovers say our tea case is 'not too big' and 'not too small', and savvy people love how it's ample storage space lends to endless uses, from storing tea, to protecting jewelry, to organizing craft supplies, to sealing in the flavor of chocolates and more. It's the perfect gift for that person who has everything, yet knows there's always room for one more thing of beauty to appreciate. THE FINEST - LIKE A COVETED ANTIQUE: Every intricate detail on this handmade tea storage chest is purposeful and perfected - from the polished, rounded edges, to the smoothly opening grooves, to the crisp velvet lining, to the interior-placed golden hinges, to the scratch-proof acrylic top - no expense was spared. DAO OF TEA - ENHANCE YOUR RITUAL: This well-appointed tea storage box is designed to enhance your tea time ritual, whether you fancy yourself indulging court side with the Queen of England, or sipping with Ancient Chinese Aristocrats who selected every intricate element to create Dao of Tea - "the perfect moment". ABUNDANT, VERSATILE STORAGE - HOLDS 70+ TEA BAGS: 6 adjustable compartments easily accommodate standard and large tea bags from your favorite artisans like Stash, Bigelow, Celestial Seasonings, Yogi, Lipton, Twinings, Tazo and Teavana. Many enjoy using it to hold jewelry, paint supplies, knick knacks and sweets. 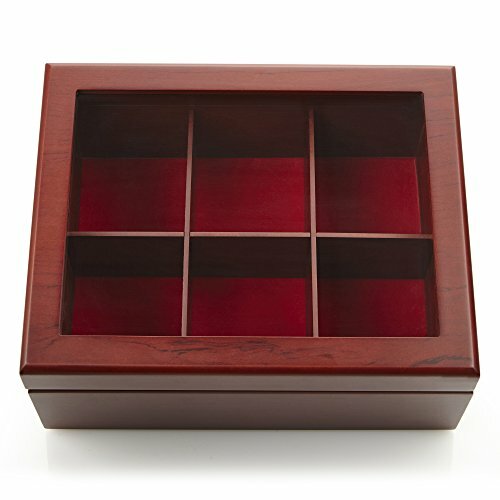 ELEVATES YOUR DÉCOR - FITS BEAUTIFULLY ON YOUR COUNTERTOP: Wooden tea box organizers of this quality are rarely seen outside tea presentation at Michelin 5 star restaurants, so you know it will enhance décor, whether you enjoy your ritual in a modern, clean lined kitchen or elegant mountain top retreat. SOPHISTICATED & INSPIRING - A GORGEOUS GIFT THAT LASTS A LIFETIME: While most choose to sell cheaply made bamboo tea storage boxes that warp over time, our premium tea organizer was engineered from the most durable craftsmen quality wood, making it the PERFECT GIFT to pass down for a lifetime.